McCain acknowledged anger on the trail Saturday. 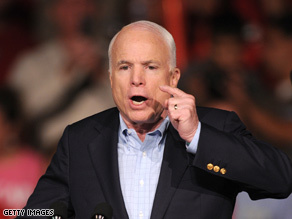 DAVENPORT, Iowa (CNN) - After days of headlines over the emotion at his campaign events, John McCain acknowledged at a rally in Davenport, Iowa Saturday that he and his supporters are angry - but insisted the anger wasn't directed at opponent Barack Obama. After a week of headlines about angry outbursts from the audience at McCain-Palin rallies directed toward Obama, the Republican nominee added some new lines in his stump speech giving a nod to the emotion on the trail. But Obama’s record didn’t entirely escape McCain’s wrath. The GOP presidential candidate pointed to a large contribution to Obama’s political campaign from a beneficiary of one of his opponent's earmarks. A protestor brandishing a sign that read “war is over” brought the crowd back to a more familiar kind of anger - but drew a measured response from McCain. You people are insane. There is no racism here. You and Obama just CAN NOT answer the questions we Americans want...why did you work with Ayers – who gave you $50 million to disperse when he worked for him, and what about his racist church with rev. Wright, and what about him paying ACORN $800,000 to get voters in the states that have commited fraud, and what about having his college records sealed, and what about his support of live birth abortions, and what about having his college paid for my radical anti-american extremists? Shall I go on?????? As a black american, I find these comments insulting. There is evidence that Obama HAS worked with terrorists in the past – anti-american terrorists. And saying the truth is NOT racist. Wake up people. He did the same thing to Hillary and he's trying the same thing on McCain. Obama is the one causing racial tension. Oh, and I am a black american but I don't attend anti-white churches. Imagine if McCain's pastor preached hate toward black people??? Then it wouldn't be ok, would it? Joe Biden is the sexiest man alive ! I am a Democrat, that was leaning to vote for McCain\Palin ticket. But after that question when the women accused Obama being an "Arab" and McCain responds was " a decent,family man" NOT a decent American family man, he lose my vote. And if something happens to Obama before this elections, America will no longer have the voice to cry injustice to those who abuses their citizens of different race, religion, or social standing. Speaking of terrorists, Is the Alaskan Separtist Group on that list? If so, why not the media attack her family (husband) for being a member of said group the why they attacked Obama ex-peacher?